The lens of the eye is normally transparent. If a cloudy area develops in the lens, it is called a cataract. When the amount of light that passes through the lens is reduced and scattered by the cataract, images are not focussed properly on the retina at the back of the eye. The result is that vision becomes increasingly poor. The lens is contained within a clear membrane called the lens capsule. The lens capsule separates the lens from the iris and the transparent, thick fluid called the vitreous body. Cataract formation affects only the lens of the eye and not any of the other important structures, such as the cornea, iris, retina or optic nerve. A cataract will often worsen to the point where surgery is needed to remove the cloudy lens and replace it with a permanent artificial lens. Removal of a cataract is the most common eye operation and one of the most common surgical procedures performed in Australia and New Zealand. It has a high rate of success due to the modern methods used by ophthalmologists. If the eye is healthy, the likelihood is that cataract surgery will restore good vision. Of every 100 operations to remove a cataract, 95 will result in significantly improved vision. Despite the proven benefits of modern cataract surgery, there are risks. • vision following surgery is usually better. The macula is a small central area of the retina. It is highly sensitive and produces detailed, colour images in the centre of the field of vision. Vision from the macula is important for driving, reading, recognition of faces and similar tasks. Macular degeneration (MD) occurs when the macula is damaged. When its normal function is disrupted, vision is affecte. MD usually affects both eyes, but it may produce symptoms in one eye long before the other eye. If MD continues to its late stages, severe visual impairment can result. In most cases, visual loss is restricted to the central part of the vision. Peripheral vision usually remains in good condition. There are several types of MD, but the most common is age-related macular degeneration (AMD). AMD usually occurs in people older than 50 years. AMD is common. About 15 in every 100 people older than 50 have early signs of AMD. This includes disturbances of pigments in the retina and development of drusen, yellow deposits under the retina that may be a risk factor for AMD. Such initial changes in the macula are called "early AMD", but symptoms of visual disturbances are mild or not present. When complications of AMD threaten sight and cause substantial disturbances of vision, the condition is called "late AMD". The two types of late AMD are "dry" and "wet". 1. Dry AMD develops slowly, usually over some years. As cells in the macula die in small patches, images fade and are unfocused. About four out of 10 people with late AMD have the dry type. 2. 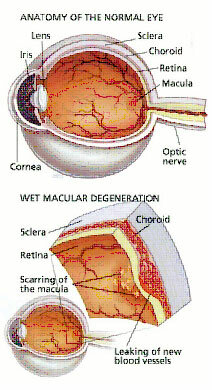 With wet AMD, new abnormal blood vessels grow from the choroid layer into the macula (see diagram, above). 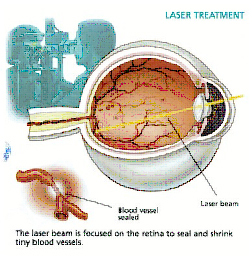 These vessels leak and bleed, leading to distorted vision and eventually to injured macula and retina. Scar tissue forms in and around the macula, and central vision is severely affected. Then the quality of vision is affected or even lost. In people with diabetes, tiny blood vessels in the retina may become diseased and damaged due to the effects of diabetes. Diabetes can cause the blood vessels to swell and leak blood or fluid around the retina. As they heal, scar tissue forms on the retina. These problems can damage the retina so badly that the retina functions less effectively and vision is impaired. This disease process is called diabetic retinopathy. It usually affects the retina slowly, over months or years. The longer a person has diabetes, the greater the risk of diabetic retinopathy occurring. The area of the retina that provides the sharpest vision is called the macula. Leaking blood or fluid can cause the macula to swell, which is called macular oedema. This causes blurred vision and is a common result of diabetic retinopathy. Blood vessels can grow and eventually bleed. This can cause a less common but more damaging form of retinopathy that can lead to blindness. Diabetic retinopathy is the leading cause of new cases of blindness in adults in Australia, New Zealand and most Western countries. All people with diabetes are at risk of developing retinopathy to some degree. Glaucoma is the name given to a group of eye diseases often associated with too much pressure inside one or both eyeballs. It is a leading cause of damage to vision or blindness in people over 40 but can affect people of any age. If glaucoma is detected early, treatment can prevent or reduce loss of vision in most patients. The aqueous humour is a clear, watery fluid produced by the ciliary body. Its role is to nourish the lens and cornea. It drains out of the eye through a sieve like structure - the trabecular meshwork (as shown in the figure). Glaucoma occurs when the amount of aqueous fluid pumped into the eye by the ciliary body is greater than the fluid flowing out of the eye through the trabecular meshwork. This imbalance increases the pressure, also called intraocular pressure. This increase in intraocular pressure results in damage to the delicate fibres of the optic nerve that connects the eye to the brain. This damage is permanent. The aim of treatment is to decrease fluid production or to increase fluid drainage. This is the most common type of glaucoma. As the condition is usually painless and without symptoms, it can slowly damage the eye without the person being aware it is present. 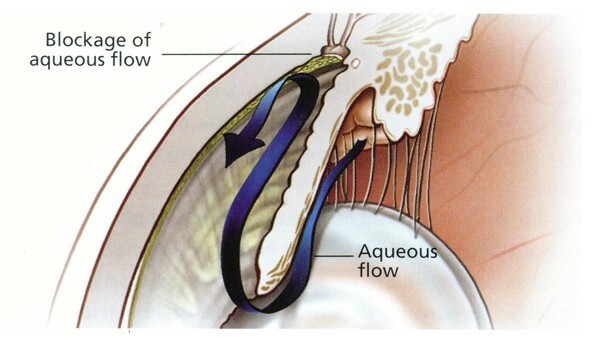 In open-angle glaucoma, the aqueous fluid cannot flow through the trabecular meshwork and drain properly, causing the pressure in the eye to rise and eventually damage the optic nerve. Angle-closure glaucoma usually causes sudden, severe pain in the eye, often with immediate disturbance of vision, such as coloured rings around lights. The patient may have nausea and vomiting. Damage to the optic nerve can occur within hours. 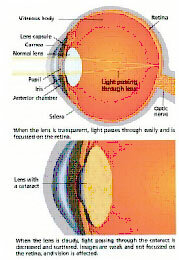 Emergency treatment (usually medication and laser) is needed to prevent partial or complete loss of vision. 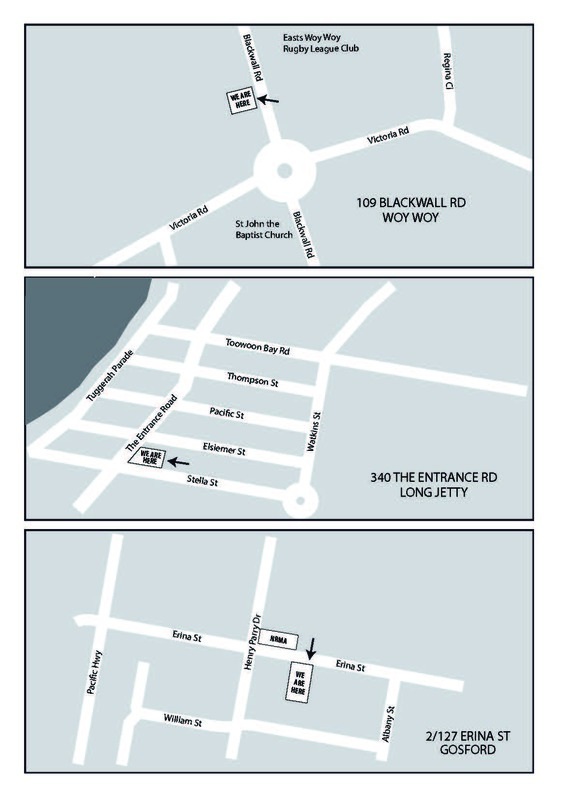 Some images and information provided courtesy of RANZCO and Mi-tec Medical Publishing. The complete RANZCO patient education pamphlet is available from your ophthalmologist. Vitreoretinal surgery is a specialised form of eye surgery for several uncommon ocular conditions such as retinal detachment, macular hole, epiretinal memebrane (also known as macular pucker), vitreous haemorrhage (bleeding inside the vitreous cavity typically from proliferative diabetic retinopathy, retinal tears, or retinal detachment), and severe ocular trauma, including retrieval and scleral fixation of dislocated intraocular lenses. There are many problems which can affect the eyelids, including eyelids that are turned out (ectropion), eyelids that are turned in (entropion), and lax skin of the upper lids (dermatochalasis). Most of these conditions can be treated with lid surgery under a local anesthetic. Blepharoplasty is a commonly performed cosmetic or functional eyelid operation for excess skin in the eyelids knows as dermatochalasis. There has been a rapid evolution of corneal surgery in recent years such that penetrating keratoplasty, also known as corneal grafting, has become supplemented with a variety of new corneal surgical techniques tailored to the specific corneal layers that are affected by disease. Keratoconus, herpetic keratitis, penetrating ocular trauma are the most common diseases which can be treated by corneal surgery. While the doctors at Central Coast Eye Specialists have subspecialty expertise and interests, all of them are trained to carry out comprehensive general eye checks and examinations. Our experienced orthoptic staff are also well trained and highly competent in assessing vision and performing detailed eye examinations and testing with a variety of sophisticated instruments. The general eye examination includes a number of tests that ascertain the health, function and appearance of different parts of the eye. • Visual acuity test checks how well you can see from a distance of about 20 feet. You are asked to read aloud the letters written on a chart or screen (Snellen chart). The letters decrease in size as you read from the top line to the bottom line. • Eye muscle test checks the function of the eye muscle used for movement of the eye. The doctor will ask you to look at a pen or any other object without moving the neck while the doctor moves it in various directions. • Refraction test determines whether you need corrective lenses or your vision is normal. In case you need corrective lenses, it determines the prescription of the lens that will give you the best possible vision. Your doctor may use a computerized refractor or retinoscopy to determine your prescription for corrective lenses. In retinoscopy the doctor shines a light into the eye after dilation and estimates the refractive error. Then fine adjustments for the prescription are done by having you look through a variety of lenses in a mask like device or Phoropter to give you the sharpest vision. • Visual field test measures peripheral or side vision. It may be done using automated perimetry in which you will be asked to look into a special instrument that flashes light. If you see the light you are asked to press a button. It may also be determined by a confrontation visual field exam in which you cover one of your eyes and look at your doctor’s hand as it moves inward and outward from your visual field. You should tell your doctor when you are able to see his hand or fingers. • Colour vision test: In this test, the doctor will show you certain multi-coloured dot patterns. In case you have a certain colour deficiency you will not be able to see certain patterns on those given sheets. • Slit lamp examination: You are asked to sit and rest your chin and touch your forehead on the slit lamp. The lamp magnifies the image of the eye and allows the doctor to look for any problems of the cornea, lens, iris and anterior chamber of the eye. Sometimes the doctor may stain the tear film of the eye with a fluorescein dye by using eye drops or by using a paper strip before examining through the slit lamp to look for cuts, foreign objects or infections of the cornea. • Retinal examination is done to check for diseases of the retina or optic nerve present at the back of the eye. The doctor will try to see the back of the eye using an ophthalmoscope or slit lamp following dilation of the pupil. The doctor may also choose to do an indirect examination by using a bright light mounted on the head while each eye is kept open during examination. The eye drops used for examination will cause blurred vision and sensitivity to light for several hours after the test. The effect will go away after a day or so. • Glaucoma test is used to measure the internal eye pressure. A pterygium is a wedge-shaped growth of thickened tissue that covers the white part of the eye. 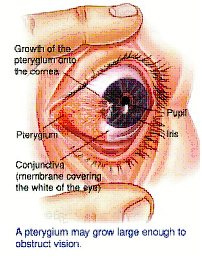 A pterygium (pronounced ter-ig'-ee-um) typically starts growing near the inside corner of the eye. It often extends onto the cornea, toward the pupil. Both eyes can be affected. Composed of conjunctival tissue, a pterygium may grow large enough to interfere with sight and can cause other annoying symptoms. In these cases, it may have to be surgically removed. If a pterygium does not interfere with sight or cause annoying symptoms, it can safely be left alone. A pterygium is not a cancer and will not develop into a cancer. Usually, they grow very slowly. PINGUECULA: A pinguecula (pin-gwek'- u-lah) is similar to a pterygium. It is usually a soft yellow mass confined to the white part of the eye. It can be surgically removed in the same way as a pterygium, but this is rarely necessary. Although the exact cause of a pterygium is not known, it is more likely to develop in people who live in tropical climates, work outdoors and spend a lot of time in the sun. Exposure to ultraviolet rays from the sun is thought to play a major part in pterygium formation. Pterygia occur three times more frequently in men than in women. They rarely develop in children.